The work is accompanied by a certificate of authenticity by the Comité Marc Chagall, Paris. 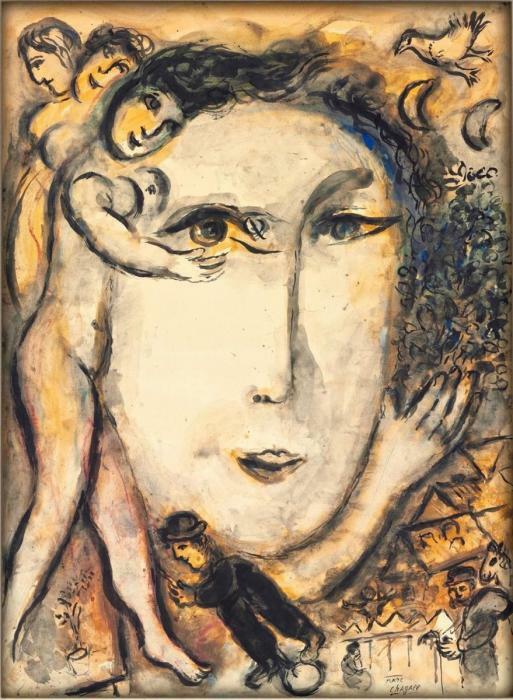 The Siren or Le Visage contains most of Marc Chagall’s most famous themes and elements appreciated by collectors. In this work the artist has depicted a dreamlike scene with fantastical characters and animals that seem to be floating in mid-air around a large face. Very representative of his oeuvre the viewer can notice: the artist painting flowers on a canvas, the rooster, the goat, the moon, a large bouquet and in the lower right his native village of Vitebsk. - The work has been included in important retrospective exhibitions. - Great provenance: Galerie Maeght. - Hand signed (many works have not been signed or have a signature stamp of the estate). Shaindy Fenton, Inc., Fort Worth (acquired from the above). Acquired from the above by the family of the present owner, November 1979. Saint-Paul de Vence, Fondation Maeght, Hommage à Marc Chagall, Oeuvres de 1947-1967, 1967, p. 42, no. 149. Tokyo, Museum of Modern Art; Kyoto, Municipal Museum; Nagoya, Aichi Prefectural Museum and Kumamoto, Prefectural Museum, Marc Chagall, August-December 1976, no. 90 (illustrated). Munich, Haus der Kunst, Marc Chagall, Ausgewählte Graphik, August-October 1978, p. 84, no. 44 (illustrated). A.P. de Mandiargues, Chagall, New York, 1974, p. 209, no. 88 (illustrated, p. 132; titled The Siren).